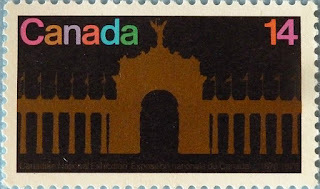 this stamp came out on the 16th of August 1978 for the centenary of the CNE, or the Canadian National Exhibition. For people in Southern Ontario, this anticipated event is also a bittersweet mark of summer's ending. It always closes on Labour Day (the first Monday in September), and the next day the kids go back to school. 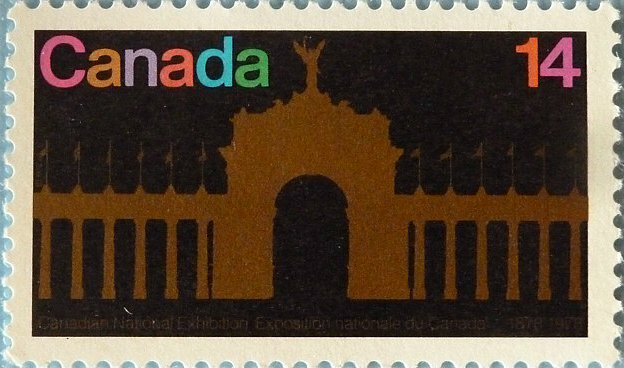 The design for this stamp features a simplified rendering of the Princes' Gates, the imposing main entrance to 'The Ex'. The varicoloured typography recalls the gaiety and excitement of this perennial people's festival according to designer Theo Dimson. It's not a particular favourite, although I love the Princes' Gates (named for Princes Edward, the Prince of Wales and later Edward VIII and his brother George who later became Duke of York, who officially opened the Gates in 1927). You can see some vintage postcards of the Princes' Gates from this post This year, if you are wanting to go to The Ex, you'll need to be in Toronto sometime between August 21 and September 7. It is quite a dark stamp for something that is commemorating an event like an Expo. It does look a bit sombre, but maybe it's thinking of school the next day. I can't say much for that stamp. I like the fruits from the last post, though. And look a the cost! 14 cents.